Forbes predicts that the new Tesla Y crossover won’t be in volume production until 2021. That would be 9 years after the 2012 introduction date of the Tesla S.
Is it fair to say that Earth’s transition to electric cars is proceeding more slowly than expected? Usually when a better technology comes along, doesn’t the old tech typically disappear from the marketplace within less than 9 years? Is the glacial transition here due to the fact that the car industry is special? That the gas station infrastructure is too hard to replace with charging infrastructure? That electric cars currently aren’t actually “better technology,” but just a way for a handful of conspicuous consumers to display their better taste and superior virtue? Something else? Readers: What do you think of the Tesla Y? Are Tesla cars improving at a faster or slower rate than cars from Honda and other engineering leaders? Phil, are you actually serious? Nine years — or even eleven years if you count the original Roadster — is an incredibly short time for such a big transition. You yourself have seen how long it takes for better technology to take over. Remember your Symbolics Lisp Machine-driven construction machines? Then you could say that the transition back to electric from gas has taken a long time. Not necessarily. The gasoline engine had a clear lead over the steam engine as a powerplant for cars at least since the teens, when the self-starter was invented but the Stanley Steamer did not go out of production until 1924. Desktop electronic calculators became available in the early 1960s but mechanical adding machine production didn’t end until the late ’70s. Etc. They cost too much is the main reason IMO. Why spend $50K for a Model 3 with limited interior features versus a nice ICE car fully equipped for $30K. And with the rebates going away and low cost gasoline the cost gap is getting worse. Plus the charging situation was very suspect to start 9 years ago. And it still does not work for anyone who does not have a suburban home to put in their own charger. Yes the Super Charger network has improved that situation some but charging is still a big issue. And finally the car interior designs are just too radical and too low cost. Musk forcing that minimalist interior and single big screen in all the cars turn off a lot of buyers. I think old technologies hang around longer than 9 years in most cases, even when there are good reasons to get rid of them. Unleaded gasoline should have displaced leaded gasoline very quickly. Unleaded was available in 1970, was banned for new cars in 1974, was limited in refineries by 1979, but wasn’t banned outright for cars until 1995. It’s still used in aviation engines. The US didn’t mandate elimination of incandescent light bulbs until 2014, and actually didn’t even do that directly. CFLs have been available since 1995, but incandescents persist, and some consumers really want them. Electric vehicles like my Tesla have some disadvantages over heat-engine powered cars, mostly around range and recharging rates. I’m happy with the tradeoffs, but not everyone will agree. So no, 9 years is not slow. In fact it’s pretty fast for a thing most people will borrow money to get. In my opinion, over time, most two vehicle families will replace one ICE vehicle with a Tesla or similar. Retaining one ICE vehicle is a way to deal with the charging issue, especially as range continues to increase. ICE vehicles have evolved to trouble-free and low maintenance, but the Teslas are mechanically simpler (fewer belts, hoses, pumps, liquid storage components, no exhaust system/catalytic converters, and less). It is the efficiency of EV versus ICE that will eventually make the difference for many drivers. A 2019 Tesla Model 3 long range has a range of 310 miles and a battery pack of 75 kWh capacity. Figure a 107% requirement for recharge to 100% requires 80.25 kWh. Electricity where I live is 14.8 cents/kWh – this is $11.88 to go 310 miles if you recharge at home. Typical ICE vehicle @ 25 mpg and $2.50/gallon gas – 12.4 gallons – $38.44. The difference really adds up over years of time. Mason: The numbers you cite work out to 8.5 cents/mile. That’s only $850/year if 10,000 miles are driven (not easy to drive 10,000 miles in a city like Boston where achieving more than 20 mph is rare!). If we look at $0 down monthly lease pricing as the true cost of owning a car (since everything is professionally calculated by the lessor), what’s the difference in annual lease cost between a Tesla 3 and a comparable ICE car? https://cars.usnews.com/cars-trucks/best-car-deals/car-lease-deals shows that a Mazda CX-5 is $315/month if we divided the up-front money by 36 and add it to the teaser monthly rate. If we save $850/year, we would need to be able to lease a Tesla 3, no money down, for $385/month, in order to come out $1/month ahead. What is the 36-month lease price of a Tesla 3? Great question – as we speak, rumors only about Tesla Model 3 leasing. I found an on-line offer for a used Model 3 long range lease $5000 down $699 per month for 36 months 12000 miles. A purchase price of $54,000 was cited – not too far from the 2019 Model 3 price. I don’t know if the 2018 has the fart mode. In general, Teslas are a high performance luxury vehicle – none of those are inexpensive. I believe Bill is correct. Electric is very capable but one must still pay a premium over an ICE powered vehicle. I was in the market two years ago and many Tesla fan friends tried to talk me into the vehicle. Because there is a soft market for sedans I was able to purchase a Hyundai hybrid priced at $36M for $28M versus a Model 3 for $59M. Even figuring the price of gasoline, with the hybrid reliably getting 40MPG I would never make up the difference. I am sure if not my next vehicle, the one following will likely be electric. There was a lot of headroom between what the lipo battery allowed & what the car industry was using for 20 years. There was no incentive to use batteries, as long as the taxpayers gave them a blank check. The battery headroom has been used up. The autonomous car craze has run its course. The boring tunnel whatever has stalled after going from a hyperloop something to a sled something to a mining car something but never figuring out what it was. There’s no difference between the Y & the 3. They merely rebranded the 3 as a Y. It could have some value if they tied it into whatever the boring thing was going to be. When I bought my last car, I was living in an apartment, with no place to install a charging unit in the parking lot. An electric car was a non-starter. I suspect there are many other situations where electric cars simply aren’t feasible (e.g., people driving in cold climates, where running the heater eats a significant amount of range). The electric car tech is robust. The battery and battery management software, less so. After viewing some effective propaganda about Musk’s Space X program, I now like the guy and whatever he is associated with. Tesla is a luxury brand. You might as well complain that Old Spice cologne costs less than Hermes Equipage. from the blog: http://www.asymco.com/2013/11/18/seeing-whats-next-2/. 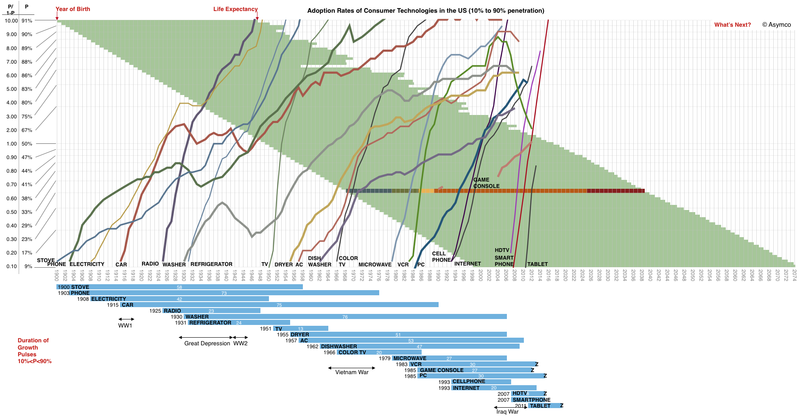 It plots the adoption rates through time, from 10% to 90%, in the USA for multiple consumer technologies. The smartphone took 9 years, but hardly anything is that fast, color TV took 20, original TV 13, refrigerator 24, PCs 30, and the car 75. Granted you don’t need a car for everyone, there was the Great Depression and World War 2 in the middle, and the adoption rate until 50% was quite fast, ~10 years. But overall, no, I would say the 9 years is the best case, not the norm. Regarding why electrical cars aren’t as fast, I agree with some of the arguments previously mentioned, with infrastructure being perhaps the most relevant one. However, I don’t buy the luxury or price one. Sure, if they were cheaper, it wouldn’t hurt, but Apple could be considered a luxury brand too and iPhones were never cheap. My main argument would be that an electrical car does not do a better job than an ICE car, except for the sole point that they’re not burning fossil fuels. For an everyday person, it does the exact same job as an ICE car: you drive on the same roads, you take as long to get there, you carry the same loads, it occupies the same space in parking. And it’s far more expensive, when comparing with the cheapest cars. The smartphone was radically different: yes, it was far more expensive, but now you had a browser on your hand, with a touchscreen. Smartphone is a bad name, because it implies it was a better phone – it was not; it was a tiny handheld computer that also made calls. An electrical car is just a car, with a different propulsion system. For the manufacturers, on the other hand, the barrier to entry is high. If Tesla had made the cars as popular as iPhones, everyone would be switching much faster. Yet Tesla didn’t manage it that fast, because the overall product isn’t radically new enough to be a “must”. but is any of this worth paying the premium? For some yes, but definitely not the majority. As of now, they’re not disruptive enough. Those tiny cars will be interesting. They are better versions of our golf carts. And golf carts work great in small towns. I would use one in Arizona if the speed limit was lower and there were no big trucks to avoid. Sun City has bike/golf cart lanes. So lots of golf carts are used there. The Villages in Florida has some of these paths and lots of golf carts. I bet Boston could improve traffic a lot with these small cars. It really takes 40 years for a new technology to replace older one. This is largely due to competing standards and ideas in the marketplace. The old tech companies may fight it or competing new companies may fight over standards. Railroads. Electricity. Gas Powered vehicles all took about 40 years to be established and reliable in the marketplace. The Internet was special because the biggest blocker to the Internet, the telephone company was broken up in 1982, and modem development was deregulated (Bell was no longer able to prevent new entrants to the marketplace with expensive/slow certification). Modem speeds increased from 1200/2400 bps to 9600/14400 in 10 years, 28,800 in 2 more, and 56k in another 5. Then high speed took over in the late 1990’s. The deregulation of telecom made all this possible, as the telephone company no longer had a monopoly. If you go back to the start of BitNet (college networked computers) as the start of Internet, probably 1980, then full acceptance was achieved after the 2001 tech crash, say 2003 or 2004, then the Internet took about 24 years. But there were not competing companies for standards, and no “blockers”. Oil companies and traditional car companies are slow on the uptake of electric cars, and while the environmental benefits are pretty clear, the range and availability of charging stations remain an issue. And are they standardized? I think the transition to electric cars is running at a fairly high pace.